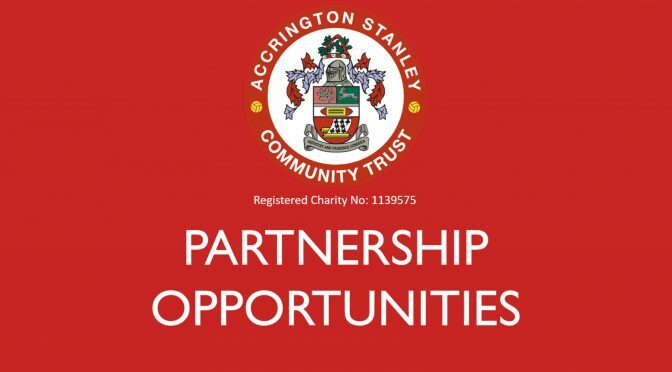 Accrington Stanley Community Trust deliver sport, health, education and inclusion projects to over 10,000 people across East Lancashire. Our mission is to support the local community and promote a healthier lifestyle by encouraging individuals to take part in fun based activities, which develop confidence, co-operation and education, and your business can be a part of that. Whether you have a corporate social responsibility agenda to meet, employees to nurture and develop or you just want to give back and engage the community you trade in we have the right programme for you. A track record of excellent delivery on over 30 community projects, your business can associate with our award winning charity whilst attaining excellent PR and marketing opportunities. If you’re interested in becoming a business partner then please feel free to take a look at our opportunities below. Read our Partnership and Sponsorship Opportunities brochure by clicking the link below. Contact martin.fearon@stanleytrust.co.uk for more information on our Sports Hub partnership and sponsorship opportunities.